This was my first time reading John Gwynne, and wow, he is the real deal, folks. Now I wish I had jumped on board his Faithful and the Fallen series when I had the chance. 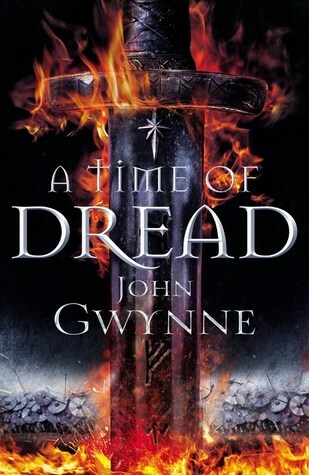 However, I am glad I was able to read his new book, A Time of Dread, which is the start of a new trilogy called Of Blood and Bone. Set in the same world as Gwynne’s previous series, this novel takes place approximately 120 years after Wrath, its concluding volume. Thankfully, you don’t have to be familiar with anything that happened before, since this story is designed in such a way that even newcomers like me could pick it up with ease. Peace had finally come to the Land of the Faithful, following the defeat of Kadoshim hordes led by their commander Asroth. The race of warrior angels known as the Ben-Elim, who fought alongside the humans and giants to victory, now rule from their fortress of Drassil, hunting down the remnants of their enemy. The demonic hordes of the Kadoshim may be shattered and their leader imprisoned, but Asroth still has many faithful followers who are out there committing the worst kinds of atrocities, hoping that their side will one day rise again. In true epic fantasy fashion, A Time of Dread is told through the perspectives of less than four characters, starting with Bleda, a young prince from a warrior tribe who was taken from his home to become a ward of the Ben-Elim in order to promote peace between their peoples. Feeling out of place at Drassil, he nonetheless trains with the other fighters so that he can fit in and help his hosts defend their fortress. Next up is Drem, a boy who was raised in the wilderness by his nomadic father, who taught his son all kinds of survival skills like how to trap and hunt. One day, Drem stumbles upon a number of mutilated corpses in the forest, a clear sign that demonic black magic may be at work. Then there’s Riv, another warrior-in-training within the walls of Drassil, who hopes to one day join her mother and sister in the ranks of the White Wings, the elite soldiers of the Ben-Elim. And finally, there’s Sig, who was apparently a side character in the Faithful and the Fallen series, but now she gets her chance to shine as a major POV. A bear-riding giantess, Sig is partnered with the Ben-Elim, patrolling the area for any threats. This may seem like a lot to take in, but the novel starts off at measured pace and introduces each element of the world gradually, filling in its rich history and the characters’ backgrounds. This narrative steadily broadens as we move from within the confines of fortresses into the wider spheres beyond, focusing on the big picture and the roles our main characters play within this framework. Some of them are linked almost right away, such as the interactions between Riv and Bleda hinting at a burgeoning relationship between them, while others like Drem lie in wait in the sidelines until the time comes for his involvement in the story’s overall conflict. Of course, as with most multi-POV books, I had my personal favorites like Sig. However, because of how well the author balanced character development, I felt I could connect with any of them no matter how often the focus switched between them. I found all of them equally compelling, my heart going out to Bleda for his bravery and determination to do what’s right no matter what, Riv for her genuine personality even though she can be quite temperament and impulsive at times, Drem for his independence and resilience to bounce back from tragedy and loss, and Sig for her loyalty and the great wisdom she has acquired over her long life. Each character had something useful to bring to the table, not to mention different reasons to cheer for them, and together they gave this book an eclectic assortment of personalities and viewpoints, keeping things interesting. The only criticism I have is the slow pacing of the first half, but quite honestly, it’s a common enough pattern when it comes to epic fantasy series openers, so I’m certainly not going to hold that against the novel too much. There was also a lot of world-building to establish and plenty of characters to introduce, so the extra time spent on these details was necessary, not to mention the fascinating tidbits of lore revealed from the previous series also made it all worth it. In the end, I’m glad I got to finally read John Gwynne, and A Time of Dread was a very good place to start. While the story may have been slower to take off, the second half of the book was incredibly thrilling and intense, leaving me thoroughly entranced and eager to continue the saga. Does this make you want to read his Faithful and Fallen series? Lashaan has had good things to say about Gwynne and I’m wondering about adding him. So if I add F&F first and read through, maybe more of this trilogy will be out by the time I get around to it. But it is on your list. At the moment, that is good enough for me. hahahaaha! You need some organization! There’s a good chance they’ll get it too then! Definitely epic! And yes, I was glad I could jump into this series with no problems. As much as I love the idea of a bear-riding giantess, these kinds of epic fantasies are just not for me. But I’m pretty sure my guy would love this one, so I might have to snag a copy for him…especially since you don’t need to be familiar with Gwynne’s other series to enjoy this one! Yeah, this is straight up epic fantasy, so if you know the genre isn’t for you, this one probably won’t work. Glad to hear your guy will enjoy it though! Fantastic review! I just bought the hardcover last week in London because… cover crush!!! This is such a sweet review. It’s so cool how your blog is also made of multiple bloggers, which makes it a lot of fun. Yes, some books are too slow paced in the first half, but if it’s a good book, as you reviewed ‘A Time of Dread’, it’s definitely worth the wait. We’ll be keeping our eyes out for this one. Huh, I’ve been holding back on reading Gwynne, it looked so… typical. But you make me think it’s worth a try. While I definitely wouldn’t say it’s too far off from being your quintessential epic fantasy, it does have some surprises and twists you won’t see anywhere else, so that’s a point in its favor 😀 And the writing is great too! Slowish start aside I loved this too – Sig was my favourite but all the characters were good and the writing was excellent. Gwynne can certainly write action scenes that positively take your breath away.